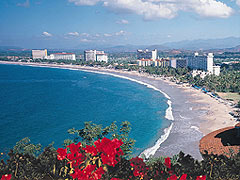 Ixtapa and Zihuatanejo, on the "Mexican Riviera" are considered two resorts in one. 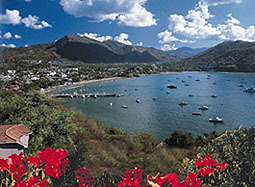 Located in the northwestern part of the state of Guerrero, 150 miles up the coast from Acapulco via coastal Highway 200. Unlike any other Mexican beach resort destination, it comprises two entirely different places with distinct lifestyles, Ixtapa and Zihuatanejo, only 7 kilometers (4.3 miles) apart. Ixtapa, a modern, world-class resort was born in early 1972 when FONATUR (the National Fund for Tourism Development), which also developed resorts such as Cancún and Huatulco, began designing the master plan. In the case of Ixtapa, the fifty percent land allotments must remain "green" -- hotels, commercial and residential structures are limited in size proportionate to their land area. Also, growth here is limited. The entire "hotel zone" extends along just a 2-mile strip of wide sandy beach called Playa del Palmar, on the open Pacific. This is one of many beaches in and around Ixtapa - Zihuatanejo. Across Boulevard Ixtapa and the hotels are village-like shopping malls, and it is all walkable. At one end of Ixtapa, as you enter on the way from Zihuatanejo, is the 18-hole Ixtapa Golf Club. At the other end, the Marina Ixtapa development includes a 600-slip yacht marina, a nautical-ambience promenade with restaurants and shops, and the new 18-hole Marina Golf Course. Zihuatanejo, down the coast (southeast) from Ixtapa is an old fishing town on a picturesque sheltered bay that is only 1.6 miles wide. Until the advent of Ixtapa, Zihuatanejo was hardly known even among Mexicans. With the advent of Ixtapa, Zihuatanejo began to grow and the little dirt streets were paved with decorative brick. Yet, the town retains its original charm, traditions and congeniality. The easily walkable central area (el centro), with small restaurants, shops and a delightful brick-paved beachfront promenade (paseo del pescador or fisherman's walk) is only a quarter of a mile wide. The temperature averages 79 degrees Fahrenheit, with summer highs in the low 90s and winter highs in the upper 80s. During the rainy season, June through September, showers are usually brief and generally at night, so the sun shines practically every day. Toward the end of the rainy season, the countryside and the mountainous backdrop of the Sierra Madre del Sur turn brilliantly green with multicolored blossoms of trees and flowers. A few months after the rainy season, vegetation turns gradually brown until the rainy season begins again. For those wishing to venture outside these two spectacularly beautiful resorts, small fishing villages such as Troncones and Barra de Potosi make wonderful day trips.